Owned by our family since 1988, the Maranee represents the exact model of Chris-Craft that I dreamed of having as a youngster. A long and loving partnership between my father and me with regards to old wooden yachts allowed us to share the joys of classic cruising together aboard three different boats. I learned so very much about maintenance, construction, engines, piloting and woodworking as I grew up alongside this patient man, working together on innumerable projects. As a young boy, I was given specific bulkheads to paint, or certain fastenings to tighten, and always treasured the warm compliments certain to come my way upon completion of the job. 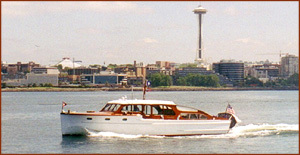 Often we would see a lovely older Chris-Craft double cabin cruiser out on Lake Union or on Puget Sound, and we would talk to each other about what a perfect family boat such a vessel would make: a little over 40 feet long, twin engines, two staterooms, two heads, and gorgeous woodwork inside and out. Such a yacht seemed a large step up from our boat at the time, the 30 foot 1934 cruiser Mascot. When we became partners in restoring a 1941 30’ Chris-Craft sedan some years later, my father and I cherished the time we spent together. We enjoyed equally the time spent working on the boat and the time spent out on the water. The Terry-Deb was a lovely boat and an able cruiser, and my wife and I shared the joys of raising our children and teaching them to love and respect the water aboard her. Occasional dreams about a larger classic boat led us one summer to inquire about an old Chris-Craft for sale moored right across from the Terry-Deb hidden under a big tarp. She turned out to be a 1940 42 foot double cabin model, and as my father and I wandered through her lovely cabins, we wondered if this might not be one of the very boats we had seen and admired some thirty years earlier. She was healthy and had been very well taken care of, but needed many systems restored, and had had most of her beautiful exterior mahogany painted over. Nevertheless, we felt strongly about the old boat. My father encouraged my wife and me to purchase the Maranee, and we all began together to plan for restoration and cruising. Sadly this meant saying goodbye to our wonderful Terry-Deb, and as Dad and I cruised together aboard her one last time to move her to a broker’s dock, he said, "I feel like we are taking her to an orphanage." The Maranee received much attention for the next 10 months, with exterior woodwork stripped and refinished, water and electrical systems upgraded, engine work done and interior surfaces cleaned, painted and varnished. Her first real cruise was to a classic yacht rendezvous at Port Ludlow in June of the next year. My father had been unable to help much after the first few months of the project, as his health had begun to deteriorate rather rapidly, but his encouragement and advice had helped us immensely. He shared in our happiness upon our return from that first cruise, and enjoyed hearing about how the boat had performed and looked. Two short weeks later, Dad passed away. We continued to work that summer on the restoration, but of course felt very much alone without his encouragement and guidance. His spirit has helped sustain us through many more projects on the boat over the years, and I often think of him as we cruise the waters of Lake Union or Puget Sound, remembering how he pointed out boats just like the Maranee to me when they would pass by. We are proud to be Maranee's custodians, and look forward to many more years of classic cruising aboard.